When you think of ‘swoosh’ what comes first? Nike or Newport Cigarettes? I should add that for the purposes of comparison, I have rotated the Newport logo 180 degrees, but in it’s own environment it is the other way up. Everyone likes a bit of potential plagiarism from time-to-time. This is not new news by any stretch of the imagination, but how many people seem to realise how the Nike Swoosh logo resembles the classic Newport Cigarette logo. Either you know and it’s old news, you know and don’t care, or it’s new news to you. I recall hearing about this a while back, but it left my memory an equally long time ago. It is however an interesting example of how one brand mark, Nike in this case, is late to the party. That through sheer dominance, exerts it’s brand awareness to a point where no one would even think to question they were not originators of the so called infamous ‘Swoosh’. In an ideal world, which of course this isn’t, but it it were, the ‘swoosh’ should be referred to as the Newport Swoosh, but personally don’t see that taking off. It’s a little but more interesting though when you dig around the history of the two companies. 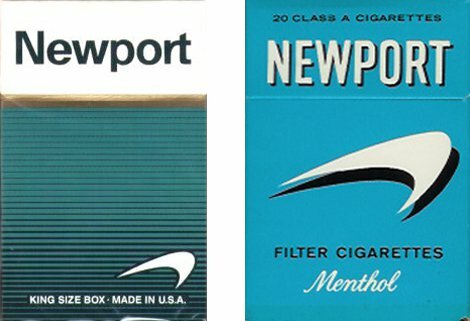 Newport was introduced in 1957, a brand of menthol cigarettes produced by Lorillard Tobacco Company of Greensboro, North Carolina, United States. Nike was actually formed on January 25, 1964 as Blue Ribbon Sports by Bill Bowerman and Philip Knight, and officially became Nike, Inc. in 1978. The Nike swoosh is a logo design created in 1971 by Carolyn Davidson, over a decade after Newport Cigarettes came into being. So Nike in fact VERY late in using the Newport Swoosh as it’s own brandmark. Interesting that they are in effect total opposites in terms of business focus, both health related, with very different agenda’s. Have tried to track down a photo of this, but so far have failed, but interesting again to see that really, this Nike Swoosh is not so ‘great’, it’s just made great by the sheer power of the people who buy Nike gear. No doubt this mark is a powerful brand icon, it has simplicity and boldness, but it’s far from original. The same could be said for Apple’s logo of course, but that’s another story. Have also tried to track down any information on the designer of the Newport Swoosh logo, but so far drawn a blank. Found this interesting video below on the sameness of the Nike and Newport logo. Via Xplosiveworld.com. 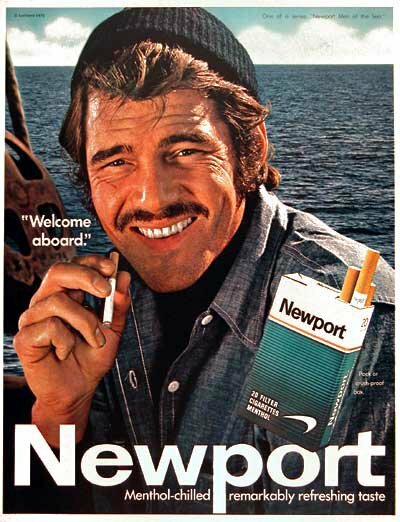 For some added bonus points, here is a lovely vintage Newport Cigarette advertisement circa 1970. One of a series of “Newport Men of the Sea”. What a man. This whole topic of plagiarism and inspiration is a tricky subject by far. I think many designers at some point have designed something that has proven to exist elsewhere. Their own process of design and brainstorming evolves what to them is a unique idea. It’s happened to me and I know it’s happened to many others. An idea is not unique, it’s naive to assume that more than one person in the entire world is NOT capable of having the same idea, created from different circumstances and inspiration. Or that indeed two people on opposite sides of the world both being inspired by something similar and coming up with an almost identical design is again more than possible. Being inspired on a conscious level is quite different to being inspired on a sub conscious level, where we believe what we are designing is formed from our own creative process, but was in fact inspired by seeing someone long ago, but long forgotten. Until you are faced with that very same original inspiration, brought to you by another designer, along with a comment of ‘you copied their design’. Your reaction is that you didn’t copy it, but if you allow yourself a moment to consider the possibilities, it dawns on you that yes, you were probably inspired on a sub conscious level. But your actions were not deliberate, yet you get ‘called out’ as a faker. It’s only through the internet that we are now faced with being ‘caught out’ more than was possible pre internet.